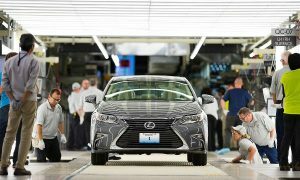 The Japan Automobile Manufacturers Association’s U.S. office (JAMA USA) has released its 2015 advance contributions data, highlighting Japanese-brand automakers’ growing economic contributions to America. The data features JAMA members’ cumulative investment, direct employment, dealer-network employment, production, and sales in the U.S., as well as exports from their U.S. manufacturing plants. With Japanese-brand automakers’ cumulative investment in the U.S. exceeding $45 billion as of 2015, JAMA members have increasingly demonstrated their commitment to building and selling their vehicles here over the last four decades. “For the first time in history, more than 75 percent of Japanese-brand vehicles sold in the U.S. are made in North America – this proves that our members’ commitment to manufacturing in America remains as strong as ever,” added Manriquez. While this new data shows that JAMA members’ are integral to the U.S. automotive industry, their impact in the U.S. goes far beyond raw production numbers and direct investment.